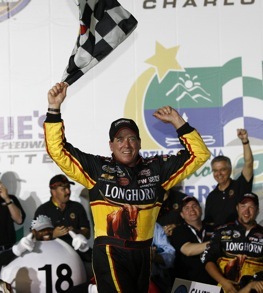 Hornaday gave much of the credit for his win to his crew and the preparation and testing they did beforehand, such as perfecting a set of shocks on the team’s seven-post testing rig. “That’s the first set of shocks that I ever changed my driving style to,” he said, adding that he didn’t really pay attention to the fact that his competitors were wrecking out ahead of him, other than being concerned for Mike Skinner after a hard crash early in the race. Hornaday overcame a mid-race green-flag pit stop that put him a lap down, bounced back and took the lead with 29 laps to go. He held on to get the win over Kyle Busch, Matt Crafton, Ryan Newman and Terry Cook. It was his 40th truck victory in 231 career starts, his first of the season and his second at Lowe’s Motor Speedway. Skinner, who entered the North Carolina Education Lottery 300 with the series points lead, was involved in a spectacular, violent crash on the frontstretch at Lap 34. After apparent contact with the No. 13 truck of Johnny Sauter, he spun around then was shoved into the wall by the oncoming truck of T.J. Bell. Skinner’s truck was knocked nose-first into the wall, rolled over on its side, slid down the track and tumbled over onto what was left of its wheels. Skinner emerged unhurt, but dropped to second in the standings, 84 behind the new leader, H ornaday. The race was red-flagged for 35 minutes so track workers could repair the SAFER barrier. Hornaday said that’s not the way he likes to gain ground in the points standings. Colin Braun led 43 laps in his No. 6 Ford, but an incident with Kyle Busch on Lap 88 took him out of contention. Then Todd Bodine spun on Lap 96 while racing for the lead. Crafton said that after a poor run in the opening practice in a brand-new truck he never figured he’d be running in the top five at the finish. The defending race winner led seven laps late in the race but faded when it counted. “I don’t think we’ll bring this one back to a mile-and-a-half track any time soon,” he said of his truck.